Maybe it is just the fact that my trip to NYC is quickly approaching, or it could be that I just got my New York Restoration Project newsletter in the mail, but I am feeling jealous of urban gardeners and sustainability enthusiasts in the Big Apple today. I am a huge fan of Green Roofs. In my senior year at Brown, a few of my fellow urban studies classmates and I designed a Group Independent Study Project to learn about and eventually construct a green roof for course credit. At the end of the semester we actually laid the groundwork for a pretty sweet deck and roof garden on a remodeled brownstone on the Upper West Side of Manhattan. In his famous 1926 publication, 5 Points of New Architecture, Le Corbusier asserted that roof gardens were an essential element to any work of architecture. In his view, the roof garden served to restore the space that was taken up by the building to the earth, and was really a no-brainer. To Le Corbusier, building a roof garden was an essential element of balance in any building project. Over 80 years later the green roof movement is finally gaining some momentum. 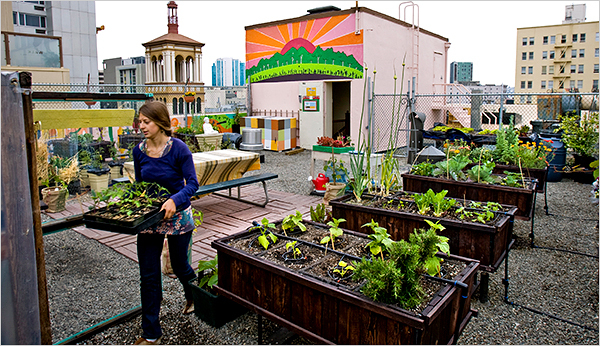 The photo above comes from an article in yesterday's New York Times titled Urban Farming, a Bit Closer to the Sun. Thanks to my buddy Colleen Ferguson for bringing it to my attention. The article has an impressive laundry list of green roofing projects. From restaurant owners to bloggers (creator of Civil Eats - linked on the right side of my page, for one), to entire public schools, people are planting edible plants on their roofs. There is a enviable amount of movement towards greener, more edible urban planning in New York right now. One of the most exciting parts about this article, to me, was that it talked a bit about the impact of tax incentives designed to encourage green roofing projects in New York and Chicago. It is incredibly exciting to me to see state and local governments encouraging people to make their roofs greener. I also find it really heartening that several of the urban roof gardeners profiled in this article were chefs or restaurant owners who were in part responding to the demand for local and organic produce from their clients. Sweet. The New York Restoration Project newsletter highlighted the Million Trees NYC initiative, which aims to plant 1 million new trees in the 5 boroughs of New York City within the next decade. Since it was launched in 2007, MillionTreesNYC has planted over 200,000 trees. Before this effort began only about 15,000 trees were planted in New York each year. To me, that is pretty incredible. My one recommendation would have been that they plant a high percentage of fruit trees that would naturally thrive in New York. Apple trees might be nice. Since they're focusing on planting in public housing projects and underserved neighborhoods, an element of food provision would have been a great touch. Ok, Los Angeles. Lets get with the program and put some money behind edible green roofs. We've got a fantastic growing season. Oh wow! Farm on the roof. Its really a very unique idea. I 'll try to use it on my own roof. Thanks a for sharing such a nice idea.